Quick Solution to American Tubbiness? 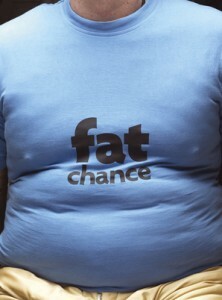 Fat Chance. “Would you give the fat guy next to you the same deference as the tall guy behind you? Why or why not?” Slate asked the question after the Twitter/media storm surrounding director/actor Kevin Smith’s February 13, 2010 ejection from a Southwest flight for being too fat. “Dear @SouthwestAir – I know I’m fat, but was Captain Leysath really justified in throwing me off a flight for which I was already seated?” Smith tweeted. As he landed in Burbank, after being seated on another flight, Smith followed up with “Hey @SouthwestAir! I’ve landed in Burbank. Don’t worry: wall of the plane was opened & I was airlifted out while Richard Simmons supervised.”. And Smith did not stop there. “Go F**k Yourself , Southwest Airlines” was the title of his SMODCAST (116) in which he blasted the airline for being the “Greyhound of the Air” and swore he would never fly with them again. Wikipedia claims that Smith pummeled Southwest with 24 further YouTube videos about the event. These replies may be appropriate for Twitter but the PR nightmare that hit Southwest from Smith’s new media-savvy fury was enough to remind any company that anything that even vaguely resembles discrimination against obese people has huge firestorm potential. The anti-PC crowd will jump on this as another example of what they see as the gutless tendency of mainstream culture to label issues as taboo and therefore necessitating extreme tiptoeing and denial. But then this is the same crowd of buffoons that blasts gays, thinks racial humor is funny and speak nostalgically of a time when shooting your mouth off was the norm. “Eat less” would be their advice to the Smiths of the world. “Talk less” seems to be society’s reply to them. So how do you appropriately treat the issue of obesity in American culture? On the one hand we push fad diets and the lean ideal, and on the other, our lifestyle (left unchecked) leads straight to plus-sized waist lines. If you attempt systemic change through education, you could end up like Michelle Obama, who, in her campaign against childhood obesity, was heavily critiqued for speaking of her concern for her own children’s body mass index (BMI) woes. Denial won’t work either: It will only ensure that our next 50 years look like the previous half-century of fast-food-fueled fatness. It seems innovation and some risk-taking could help. For all their faults, Americans have an impressive ability to rise to the occasion and rethink life. This could come in useful. Until then, lift your armrest for Kevin Smith. No sympathy for the rich overweight guy. Kudos Southwest. I have overweight friends who will probably get upset with me for that but the truth is… when you are not only endangering yourself by being obsese but others around you as well, it’s gone too far. Maybe it’s not your fault that you’re overweight (parents- GET A FREAKING CLUE ABOUT WHAT YOU’RE FEEDING YOUR KIDS), and sometimes it’s genuinely a problem that can’t be solved easily by the typical exercise regimes etc., but… come on now. Why should any person with access to nutrition and education have trouble fitting into an airline seat? Thanks for the link! Look for a post in the near future..
Obesity is no doubt a serious public health problem and it is easy to get into the blaming game.Most people are painfully aware of that they need to change their lifestyle, involving a healthy well-balanced diet and daily vigorous exercise.Avoiding alcohol in any form is another important factor. However, knowledge alone doesn’t change the situation and many obese people need individualised support. As smith had paid for two seats I can understand his indignation but it was his own fault not turning up for the plane he was booked for. The airline had to consider health and safety for everyone on the plane including Smith and therefore I think it was right to rebook him for another flight. However,we have not been told how he was ejected from the original plane.If he was allowed onboard and then asked to leave in front of other passengers it must have been very awkward and embarrasing. A week ago I was buying some soap at Walmart and had to wait while a family in front of me bought over 200 dollars worth of soda, chips, snack packs, and caprisun drinks. We’ll ignore the fact that this was in the express lane because that will get me off topic. I couldn’t believe that all of that sugar and junk was most likely going to be consumed in a week’s time clearly by children. One thing we need to be mindful of is that not only will this junk consumption effect children’s waistline, but poor nutrition also effects social/behavioral problems such as ADD or ADHD. The social cost of this goes beyond discomfort in airplanes or a rise in health care costs. It also has an impact in our schools. More hyperactive children means a greater need for paraprofessionals or support staff to deal with increased behavioral problems (Even the best teachers have a breaking point). The effect is a rising cost of local taxes to handle a larger staff, or a decrease in school funds–which usually leads to a brain drain. So, with this in mind, I am going to have to tell Silent Bob to shut the hell up and realize that defending fat has tremendous repercussions that surprisingly outweigh even him. Ah… well, I guess he did his best. It IS hurtful and embarassing when stuff like that happens, so I can understand his outrage. HOWEVER. It’s disturbing that problems like this should exist where people really do know better than to eat lard like Popeye eats spinach. nicely articulated! Michelle Obama would love you. We live in a semi-free country, so people should be semi-free to eat whatever they want and be as fat and unhealthy as they want. However, now that we pay the health care bills for a lot of these fat bastards (and apparently, will be doing more of that in the future), I think it is time to start demanding some serious standards. We should not in any way subsidize the health care of people who are fat and/or smoke. Yeah, I know that is off topic. As for Smith, although I do actually feel bad because the situation is pretty embarrassing, what can you expect Southwest to do? You can’t subject other customers to some fat guys rolls folding over the hand rest and touching the people sitting next to him. Ew…gross. David, it gladdens me to see that you have resigned yourself to the reality that health care reform will pass. Ha! David and Tristan make good points about how obesity negatively impacts not only those of us who have to sit next to Kevin Smith on a plane, but all of us. It is enough to make even those of us who are strictly for individual liberties and against government interference in our lives and business begin to think that maybe some kind of law should be passed to curb the garbage that the food industry puts out. Unfortunately the government itself is often one the worst offenders. As a teacher in the public system I’ve seen the kind of utter trash students are fed in the cafeterias, vending machines and fund-raisers in the school. If Mrs. Obama wants to curb childhood obesity that’s where she should start. And I second David’s call for no government funding of problems people bring on the themselves. Whether or not Obamacare passes according to wikipedia the U.S. Government already pays for 46 % of health care in this country. If you aren’t going to take care of yourself why should other people? It sounds cold but maybe a little “tough love” is what’s needed to encourage people to change. Hopefully in Kevin Smith’s case his experience has at least caused him to rethink his lifestyle. Though I will say as much as I’d normally be put out by having to sit next to someone with his bulk I’d be willing to make an exception for Silent Bob.